Good things come from Australia besides Hugh Jackman and Cate Blanchett. New Empire could be one of these good things. In A Breath is their third album, and they seem to have developed a solid grip of what they want to sound like. Jeremy Fowler (lead vocals, guitar, piano), Kale Kneale (percussion, vocals), Kyle Lane (lead guitar, vocals), and Nate Cairns (bass) are the guys who make it all work…and it has been working. The guys have done supporting tours for Owl City and Good Charlotte in their native Australia, so that’s not too shabby either. “Relight The Fire,” the first single off the album, is a typical feature of the group’s melodic optimistic pop, complete with a catchy repetitive chorus that makes it a dangerous earworm. “Sun Won’t Sleep” starts off like it wants to be a rock song, but the guitar doesn’t quite make enough appearances to pull it off. “A Little Braver” has a soft, sweet instrumental opening, as befits a slightly introspective love song. 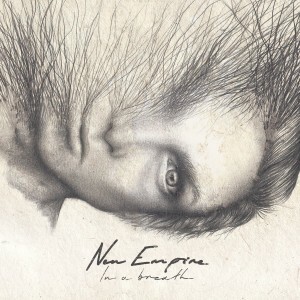 Most of the other songs will harmoniously blend into the background of radio ready pop music, but if this is what you’re looking for this happy Spring, then New Empire are your men.